I was watching a travel show in early September and saw a feature on モーニングサービス　(mouninugu saabisu), or “morning service.” The show explained that if you order just a coffee in most coffee shops in Nagoya between 6 and 11 am, you will receive food with it for free–a regional breakfast special! * So, of course, モーニング got put on my list of things to eat in Nagoya. According to this show and to my Nagoya-based friends, Nagoya’s history of cloth manufacture and trade meant that merchants were up early in the morning and often needed a quick meal before the morning markets opened. Some coffee shops started giving its customers some food with their coffee in the 1950s, and the idea took off. A morning service is usually something like bread, an egg, and fruit, though some are more elaborate–food you can eat quickly over the course of a cup of joe. 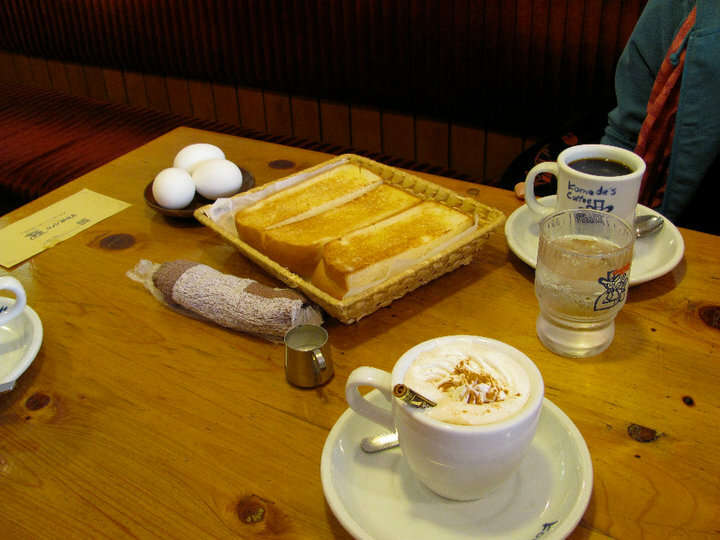 My friends and I went to Komeda, a Nagoya-based chain coffee shop for our “morning.” We all ordered coffees (I had a Viennese cinnamon cappuccino) for about 350-400 yen, and were asked which モーニング option we would like. The choice was toast or a sandwich, and given Japan’s track record with sandwiches (white bread, no crusts, egg salad in everything), we all opted for the toast. The set came with a half a slice of buttered Texas toast and a hard-boiled egg. Not the most elaborate “morning,” but delicious none the less. Interestingly, when I returned home, the Donq bakery in the train station in the capital was advertising morning sets: eggs and bacon included with your coffee. Is Nagoya culture spreading to the north? *サービス, service; a loan word that means an extra. When I get ice cream at my favorite place, the owner asks me, in English, “What kind of topping service would you like?” (You get a sample of another flavor on top.) This confused the hell out of me the first few times. サービス is wonderful, isn’t it? I didn’t know about this morning service thing. That seems pretty awesome. I’ll have to give this a try the next time I’m in Nagoya (or KZ, since I don’t really feel any desire or need to go to Nagoya again any time soon). Some of us do like Japan’s sandwiches though. Mmm crustless white bread with egg salad. One of my friends even named her blog for it: CC Lemon and Tamago Sando. Well, you know my feelings on bread….